The State Department hosted a delegation of Muslim Brotherhood-aligned leaders this week for a meeting about their ongoing efforts to oppose the current government of President Abdel Fattah al-Sisi of Egypt, who rose to power following the overthrow of Mohamed Morsi, an ally of the Brotherhood, in 2013. 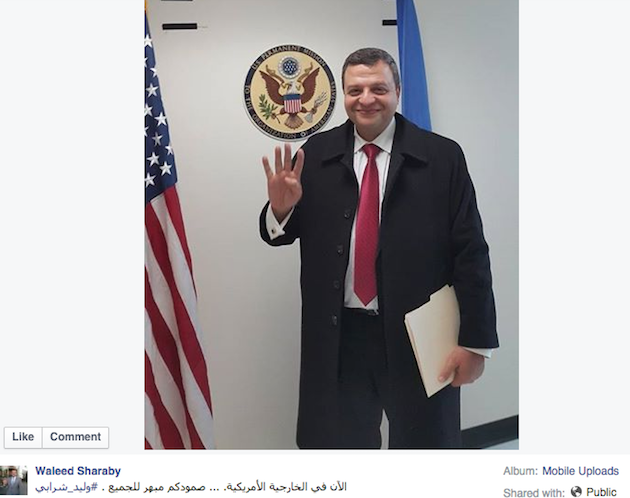 One member of the delegation, a Brotherhood-aligned judge in Egypt, posed for a picture while at Foggy Bottom in which he held up the Islamic group’s notorious four-finger Rabia symbol, according to his Facebook page. That delegation member, Waleed Sharaby, is a secretary-general of the Egyptian Revolutionary Council and a spokesman for Judges for Egypt, a group reported to have close ties to the Brotherhood. The delegation also includes Gamal Heshmat, a leading member of the Brotherhood, and Abdel Mawgoud al-Dardery, a Brotherhood member who served as a parliamentarian from Luxor. Sharaby, the Brotherhood-aligned judge, flashed the Islamist group’s popular symbol in his picture at the State Department and wrote in a caption: "Now in the U.S. State Department. Your steadfastness impresses everyone," according to an independent translation of the Arabic. Another member of the delegation, Maha Azzam, confirmed during an event hosted Tuesday by the Center for the Study of Islam and Democracy (CSID)—another group accused of having close ties to the Brotherhood—that the delegation had "fruitful" talks with the State Department. "Maha Azzam confirms that ‘anti-coup’ delegation, which includes 2 top [Muslim Brothers], had ‘fruitful’ conversations at State Dept," Egypt expert Eric Trager tweeted. Assam also said that the department expressed openness to engagement, according to one person who attended the event. Trager, a fellow at the Washington Institute for Near East Policy (WINEP), told the Washington Free Beacon that the State Department is interested in maintaining a dialogue with the Brotherhood due to its continued role in the Egyptian political scene. "The State Department continues to speak with Muslim Brothers on the assumption that Egyptian politics are unpredictable, and the Brotherhood still has some support in Egypt," he said. "But when pro-Brotherhood delegations then post photos of themselves making pro-Brotherhood gestures in front of the State Department logo, it creates an embarrassment for the State Department." When asked to comment on the meeting Tuesday evening, a State Department official said, "We meet with representatives from across the political spectrum in Egypt." The official declined to elaborate on who may have been hosted or on any details about the timing and substance of any talks. Samuel Tadros, an Egypt expert and research fellow at the Hudson Institute who is familiar with the delegation, said that the visit is meant to rally support for the Muslim Brotherhood’s ongoing efforts against to oppose Sisi. "I think the Muslim Brotherhood visit serves two goals," Tadros said. "First, organizing the pro Muslim Brotherhood movement in the U.S. among the Egyptian and other Arab and Muslim communities." "Secondly, reaching out to administration and the policy community in D.C.," Tadros said. "The delegation’s composition includes several non-official Muslim Brotherhood members to portray an image of a united Islamist and non-Islamist revolutionary camp against the regime." The delegation held several public events this week in Maryland and Virginia, according to invitations that were sent out. Patrick Poole, a terrorism expert and national security reporter, said the powwow at the State Department could be a sign that the Obama administration still considers the Brotherhood politically viable, despite its ouster from power and a subsequent crackdown on its members by Egyptian authorities. 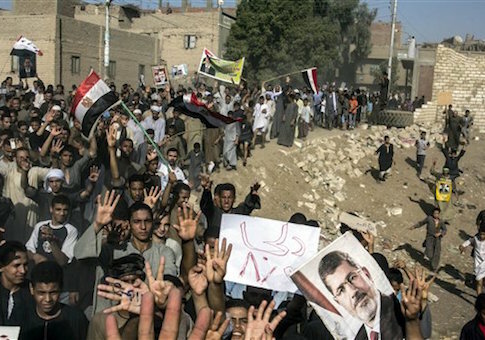 "What this shows is that the widespread rejection of the Muslim Brotherhood across the Middle East, particularly the largest protests in recorded human history in Egypt on June 30, 2013, that led to Morsi's ouster, is not recognized by the State Department and the Obama administration," Poole said. "This is a direct insult to our Egyptian allies, who are in an existential struggle against the Muslim Brotherhood, all in the pursuit of the mythical ‘moderate Islamists' who the D.C. foreign policy elite still believe will bring democracy to the Middle East," Poole said. This entry was posted in National Security and tagged Abdel Fattah al-Sisi, Egypt, Muslim Brotherhood, State Department. Bookmark the permalink.